What's the most dangerous method for liberating hostages? Definitely a 70s action movie, centred around a fad that's not related to disco or skateboarding. With a great cast and a Lalo Schifrin score, shot in 2.35 widescreen, I think this tough action movie still flies today. A gang of Baader-Meinhof (style) terrorists, disguised in hockey masks, invade a wealthy industrialist's home and kidnap his wife (Susannah York) and their two kids. For a lot of money and ammunition he can buy them back, but the Greek police (led by Charles Aznavour) won't give in to their demands. 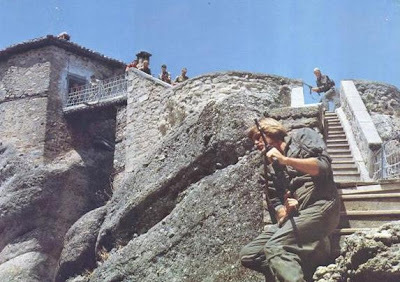 So while her husband (Robert Culp) is dealing with the police, ex-husband (James Coburn) plans to sneak into the baddies' hideout, high in a mountain-top monastery, and free the hostages himself. How on earth is he going to do that? With hang gliders! For a short while these were everywhere. James Bond even used one for a stunt in Live and Let Die (1973). 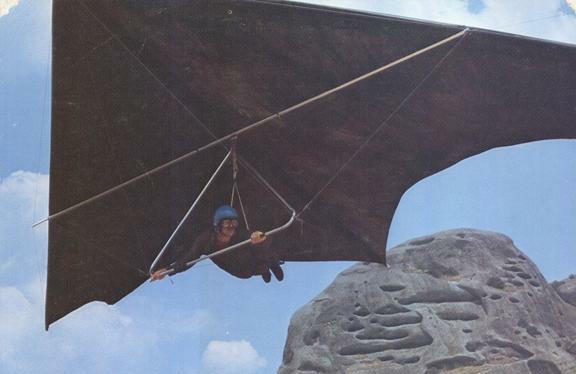 But the film that top hang glider experts recommend is Sky Riders for some of the best and most dangerous footage of the sport in its early days, before the fliers wore parachutes! The opening kidnap is dramatic enough, then there's a slow build as the rescue mission is planned out and the police investigation fouls up. It's fun to see the experts pretending to glide badly, doubling for Coburn's character as he's learning to fly. The fantastic, barely accessible location of the kidnappers' hideout is an ancient monastery, surrounded by natural sheer-walled mountains. Note that in the above photo there are more than one monastery. According to the Wikipedia entry, there are actually six in this Greek valley of Meteora, each one perched on a natural sandstone pillar. One was used in the finale of For Your Eyes Only (1981) and maybe the same one was in the live action Tintin and the Golden Fleece (1961). Horror fans take note that Max Brook's novel World War Z also uses Meteora as a handy place for keeping zombies away. I'll leave you to work out which monastery was in each - the Wikipedia article has handy photographs of each. The gliding looks dangerous and windy as the flock of hang gliders get dangerously close to the mountains. The action-packed climax packs a ton of firepower, though the original certificate remained a PG. The 'high' point of the movie is James Coburn personally performing a perilous stunt by hanging off a helicopter hundreds of feet in the air. Not essential, but a reminder of how big action scenes had to be shot for real. The story of the making of the film would probably be equally interesting. But this has a strong cast, stronger than the storyline anyway, and a gung-ho finale. 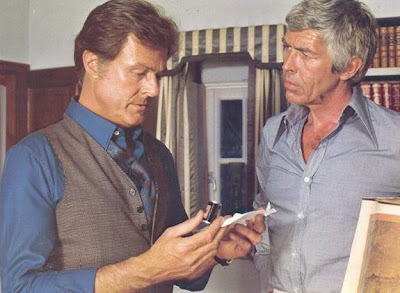 Robert Culp (the original star of the TV show I Spy) looks convincing on the big screen, when he was fighting to escape endless TV movies. But James Coburn (Our Man Flint, A Fistful of Dynamite) sneaks in to steal the best scenes! Seventies Brit-chick Susannah York (The Shout, Gold, Superman - The Movie) gets good mileage out of facing up to her female captor. Eccentrics Kenneth Griffith and Harry Andrews pep up the cast list but only get one scene each. Hunky John Beck (between supporting roles in Rollerball and The Big Bus) is largely wasted, despite being in the rescue squad. 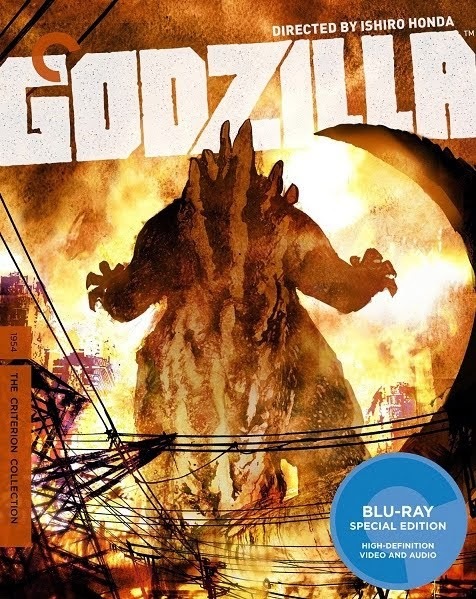 I'm not a slave to auteur theory, but director Douglas Hickox did give us several enduring cult movies - Brannigan (1975, John Wayne as a Dirty Harry-style cop wreaking havoc in London), Behemoth the Sea Monster (1959, another dinosaur wreaking havoc in London) and the marvellous Theatre of Blood (1973, Vincent Price as a Shakespearean serial killer wreaking havoc in London). 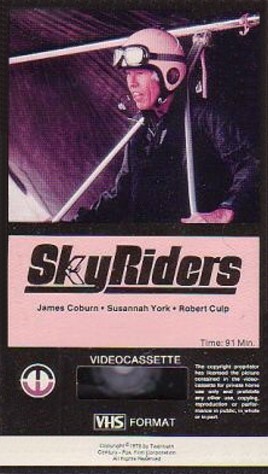 After catching Sky Riders on TV in the eighties, I've waited until now to see it in the original 2.35 widescreen. It was only previously available in cramped 'what the hell is going on' pan-and-scan vision on TV, VHS and laserdisc. Shout Factory have released Sky Riders as a James Coburn action double-bill on DVD in the US. It's rated 'R' because of the brutal Peckinpah-style western The Last Hard Men. 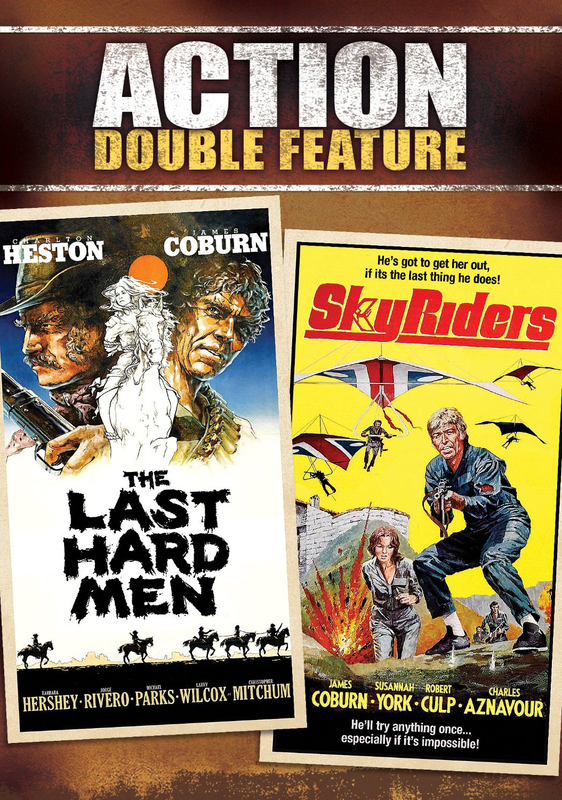 Both films are presented anamorphically in their original 2.35 widescreen, finally revealing the spectacular aerial photography throughout Sky Riders. 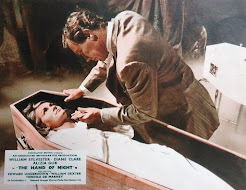 A longer review of both movies, with screengrabs, over at Eccentric Cinema, who enjoyed The Last Hard Men much more than I did. 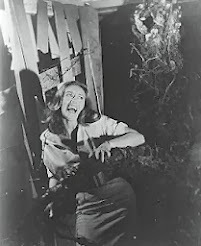 The entire movie is available on YouTube, and, you`re right, it is still quite a good film. By the way Mark, i originally saw it at the cinema in a double feature with either "Peeper" (1976) or "Pulp" (1972), both starring Michael Caine, i cant remember which one it was.